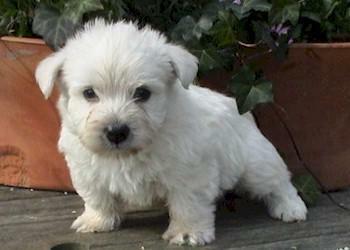 The full name of the Westy is West Highland White Terrier. This dog evolved from a hunting to a companionship dog. The choice of a good breeder is very important to get a thoroughbred Westy. A Westy never has a problem to fit in someplace. He will even get used to the city life, as long as he has enough exercise. His vivid character makes him a funny little dog. It is important to start the education in time so the Westy can learn to be a real friend for the children. His fur needs to be trimmed twice a year.